Init scripts are small shell programs that usually control services, also known as daemons. Other applications for init scripts involve simply controlling the state of something such as hdparm (HDD sleep timeouts), iptables (loading firewall rule-sets into the kernel) and setserial (COM port configuration).The /etc/init.d directory contains the scripts executed by init at boot time and when the init state. Init scripts are also important during startup and shutdown (simply "runlevel" changes on *nix systems). If you take a look at the list of processes running on your machine (try ps auwx), chances are that the process with the lowest PID is called "init". This is the parent of all processes; it's the first program the kernel starts when booting. init , which can be found in /sbin/init, is responsible for getting the system up and running after the kernel has finished booting. Rcconf allows you to control which services are started when the system boots up or reboots. It displays a menu of all the services which could be started at boot. The ones that are configured to do so are marked and you can toggle individual services on and off.This tool configures system services in connection with system runlevels. It turns on/off services using the scripts in /etc/init.d/. Rcconf works with System-V style runlevel configuration. It is a TUI(Text User Interface) frontend to the update-rc.d command. Rcconf gets a list of services from /etc/init.d and looks in the /etc/rc?.d directories to determine whether each service is on or off. If the number(NN of /etc/rc?.d/NNname) is not 20(default), rcconf saves the service name and the number in /var/lib/rcconf/services so as to be able to restore the service to its original configuration. /var/lib/rcconf/services -- The service number data file. /var/lib/rcconf/guide.default -- Guide File update-rcconf-guide generates. /var/lib/rcconf/guide -- Guide File user(Administrator) can define. by init, 0123456789S, and NN is the two-digit sequence code used by init to decide which order to run the scripts in. 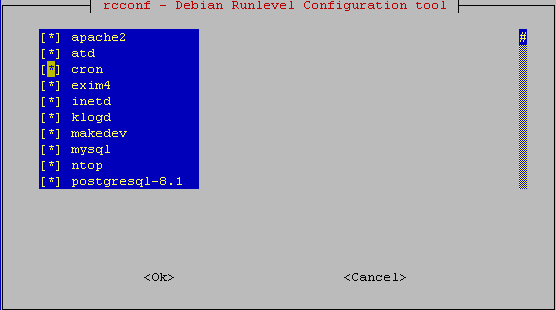 When run with either the defaults, start, or stop options, update-rc.d makes links /etc/rcrunlevel.d/[SK]NNname pointing to the script /etc/init.d/name,If any files /etc/rcrunlevel.d/[SK]? ?name already exist then update-rc.d does nothing. This is so that the system administrator can rearrange the links, provided that they leave at least one link remaining, without having their configuration overwritten. -n Don't do anything, just show what we would do. -f Force removal of symlinks even if /etc/init.d/name still exists. #update-rc.d samba start 20 2 3 4 5 . stop 20 0 1 6 . Alternative boot mechanism using a single configuration file This package provides an alternative mechanism to boot the system, to shut it down and to change runlevels. The /etc/rc?.d/* links will be converted into one single configuration file /etc/runlevel.conf instead, which is easier to administrate than symlinks, and is also more flexible. The package will automatically convert your existing symlinks into the file method on installation, and convert the file back into symlinks on removal. Both mechanisms are compatible through /etc/init.d/rc, /etc/ init.d/rcS, /usr/sbin/update-rc.d, and /usr/sbin/invoke-rc.d scripts. 0 upgraded, 1 newly installed, 2 to remove and 5 not upgraded. Need to get 36.3kB of archives. After unpacking 119kB disk space will be freed.
? ]Yes, do as I say! Package sysv-rc is to be removed. Package file-rc is not installed. Selecting previously deselected package file-rc. I’m trying to get a consensus on the optimal order in which these services should be loaded…? A common system administration error is to delete the links with the thought that this will “disable” the service, i.e., that this will prevent the service from being started. However, if all links have been deleted then the next time the package is upgraded, the package’s postinst script will run update-rc.d again and this will reinstall links at their factory default locations. The correct way to disable services is to configure the service as stopped in all runlevels in which it is started by default. In the System V init system this means renaming the service’s symbolic links from S to K.
It seems to me that correct way for disabling samba requires one more line: “update-rc.d samba stop 20 2 3 4 5 .” in addition to mentioned “update-rc.d samba remove” in the article above. I wrote a small tutorial about starting applications at boot time with root privileges in Debian Wheezy. When using update-rc.d, I needed to call it using sudo otherwise the script is not visible to “normal” users (it can be found in /usr/sbin).